Billions of animals are fed and raised each year, so humans tear down forests for feed and grazing. The impacts are widespread — profoundly affecting indigenous communities, biodiversity and the natural environment. Our hunger for beef is eating away at biodiversity. 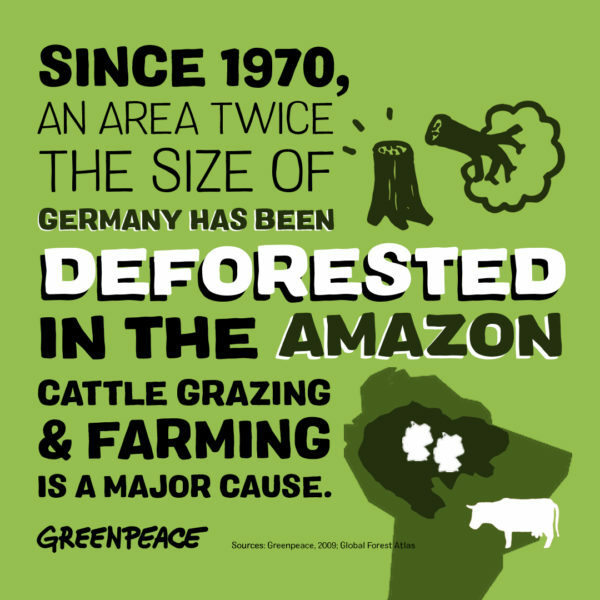 Farming soybeans for feed and cattle grazing have had a particularly devastating impact on the level of deforestation in rainforests worldwide. Tropical ecosystems act as “carbon sinks” as they regulate and store CO2 from the atmosphere — an extremely valuable asset in combating climate change. Destroying these forests has huge risks. Demolishing forests, grasslands and savannahs for cropland irreversibly impacts biodiversity. Many birds and mammals are threatened by clearing land for grazing and crop feed production.